If you ask any Victorian where to meet up in Cook St. Village, they will say “see you at the Moka”. The Moka House in Cook St. Village has been a Victoria institution for over 30 years. 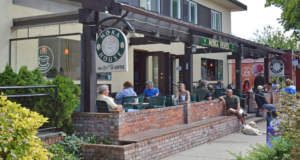 Arguably the best patio in the city, the Moka is the place to best view and take in the coolest neighborhood in Victoria. We believe the Moka is the ‘heart of the village’, so come on down and discover what makes this place so special.